How to Configure your Zoho Mail Account as IMAP in iPhone or iPad? What makes Zoho Mail a recommended email service is that whether you are using a paid version of Zoho Mail or a free version, you will never find Zoho Mail’s web interface cluttered with any sort of unwanted advertisements. This means that you can experience a secure mailing experience at Zoho Mail with no ads being displayed in your account by scanning the keywords of your messages which is the case with other email service providers. Apart from it, there are varieties of options available to organize and categorize your messages on the basis of folders, labels, filters, flags, as well as thread nesting style conversation view. If this is the type of email service you were looking for, well, get your Zoho Mail account today! Apart from using its web interface, you can also access Zoho Mail through your iPhone. To know how to access your Zoho Mail account in your iPhone, follow the information provided below. Install the native app of Zoho Mail designed for iPhone. Configure your Zoho Mail account as IMAP on your iPhone. To install the Zoho Mail app on your iPhone, simply go to the App Store and search for the Zoho Mail app. Once you find the app in the store, download and install it on your iPhone. 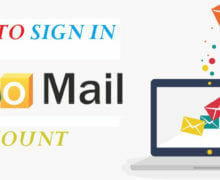 Open the app and sign in using your Zoho Mail username and password. After that, you can also sync your Contacts and Calendar to your iPhone without interfering with your device’s default Calendar and Contacts. You can then start accessing your account on your iPhone. 1.) Start by ensuring your IMAP Access is enabled for your account. For this, sign in to your Zoho Mail account and go to the Settings > Mail Account > Email forwarding and POP / IMAP > Enable IMAP. 2.) Next, in your iPhone, tap on the Settings option, select Accounts, and Passwords and tap on the Add Account option. 3.) Under the Add Account section, select “Other” option from the given list of email services. 4.) On the next screen, simply enter your Name, Email Address, Password and a short description for your account. Once you have entered the required information as prompted, tap on the Next button on your screen. NOTE: In case you have Two-Factor Authentication featured enabled for your Zoho Mail account, you will need to provide the Application Specific Password in order to configure your account as regular password are not effective in such condition. 7.) Your iPhone will start communicating to the IMAP server to authenticate the information provided by you. If the authentication gets completed successfully, your Zoho Mail will get configured as IMAP on your iPhone. NOTE: To configure folder settings for synchronization, you will need to select the new account and click on the Advanced option. Then, in the Mailbox behaviours, you will need to map your iPhone folders to the folders on the Server. NextHow to Configure Your Zoho Mail in Apple Mail Client as POP?